-Depart from LCCT to GC GC. -check-in kat our apartment...nice apartment! -next? shopping kat harbour town!!! - Carrara Market! Like our very own pasar tani but of course, Gold Coast style! -Souvenirs are abundance here but beware! Some of the souvenirs here are much more expensive than other place. Don't buy cushion covers or koala keychains here, u'll feel cheated, just like i did. - Next stop? Pacific fair! - When we went there, Terry White Chemist (just like Watson here) is holding perfume sale. I bought Britney Spears' Fantasy for less than RM100! best..best..we even had our lunch here...at Krispy Kreme! 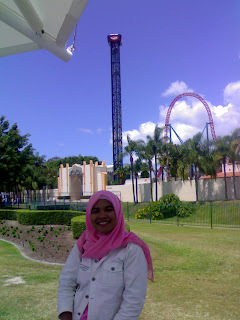 -We joined a tour coz we felt that we might not get the chance to really get to know Gold Coast on our own. The tour was fun and informative. -Our first stop is the amazing Q1 tower, the tallest residential tower in Gold Coast. Kat sini dapat amek gambar with Koala and Kanggaru k! - Whale Watching...to me, this is the hi-lite of the whole Gold Coast trip! I recommend you guys to travel to Gold Coast between July to November to experience this. -Me and Izan on the boat. But I didn't get to capture the humpback whale in action on my camera. They are just so fast. I did few videos but since the distance between the boat and the whale is quite far, we couldn't really see it. But it was real before our very own eyes. Memang best watching the whales welcome you by flipping their tail. I think, we got to see more than 5 whales in action during our 3 hour on the boat. When we were about to take-off from the whale location, a pair of whales came close to our boat. A mother and its cub. The mother was so friendly, she not only flipped her tail and swam up the water, she also did flipped her whole body when she got close to our boat, showing off to us, and swam under the boat. Priceless!! But no picture and video. Sayang sungguh! 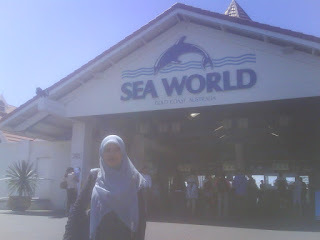 -Here, we got to see the sea animals up close and personal! There are sea-lion show, dolphins show, etc. I like dolphin show! 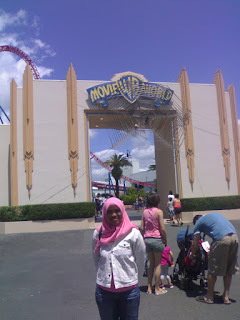 -Gold Coast is not complete without a trip to Movieworld. wow...seronok nyer la ko kan!! benci aku mendengar nyer. tapi takper someday boleh aku ke sana gak...kui kui. Glad you enjoyed the Gold Coast, I love to read about people having a good time here. Also interesting how you found the souvenirs more expensive in Carrara Markets, that is a good tip. Where did you see them cheaper? Hope you visit the amazing Gold Coast again soon. verde, kalau ade souvenirs lebih, i pass. tp takle janji laa...apartment dalam 500+ sorang for 5 nites. ok la. complete sume ada, washing machine, dryer, dishwasher, vacuum..memang berbaloi..
annie, i found items sold at shops around trinkett street, surfer paradise much more cheaper than carrara. maybe not all but some are. aizah, gambar lain byak tp kat dalam facebook. tu pun byak tak upload lg..